When you get a new puppy, housebreaking can become a big problem in your house. You can save time, energy, and stress by teaching your dog to use a bell when it needs to go outside to use the bathroom. Combine bell-training with a regular schedule and crate training for the best results. Understand the importance of a schedule. 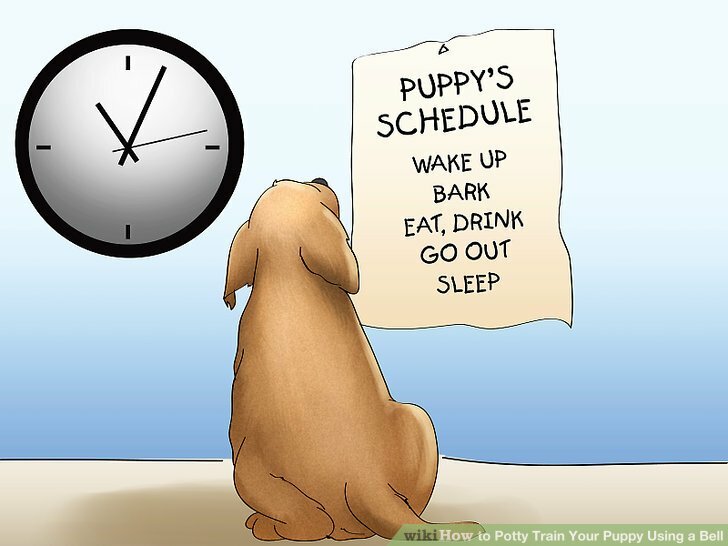 Your puppy needs to be on a schedule that you control. By regulating his feeding, sleeping, playing, and bathroom schedule, you help him fit comfortably into your life. The routine will bring him comfort, and you’ll have fewer “accidents” down the road. Most puppies should get four meals per day until they are 12 weeks old. After that, they should get 2-3 meals a day until they reach adulthood. Feed your puppy the amount recommended on the label. Many labels give only the total amount a dog should eat during the day. You’ll need to divide those amounts into portions throughout the day. To ensure the puppy grows well, feed him in meals instead of leaving food out at all times. If he doesn’t finish his food within 15 minutes, pick up and remove the rest. Very small breeds often get low blood sugar (hypoglycemia). They should be fed four smaller meals spaced out to make sure their sugar levels are healthy throughout the day. Set up a bathroom schedule. Let the puppy outside to use the bathroom after every meal, play session, and nap or night’s sleep. He’ll need a few weeks to adjust to the schedule, so expect accidents at first. But as the puppy grows up, he’ll be able to go for longer periods between bathroom sessions. Puppies 6-8 weeks old need to use the bathroom every hour during the day until they’re housebroken. At night, you should let them out every 2-4 hours. Puppies 8-16 weeks old should be able to hold it for about two hours during the day and four hours at night. Get your puppy on a regular sleep schedule. This includes a regular bedtime that comes right after a bathroom break. Even when they’re as young as eight weeks old, some puppies will sleep for a full eight hours during the night. Most, though, will need to use the bathroom at least once during the night. 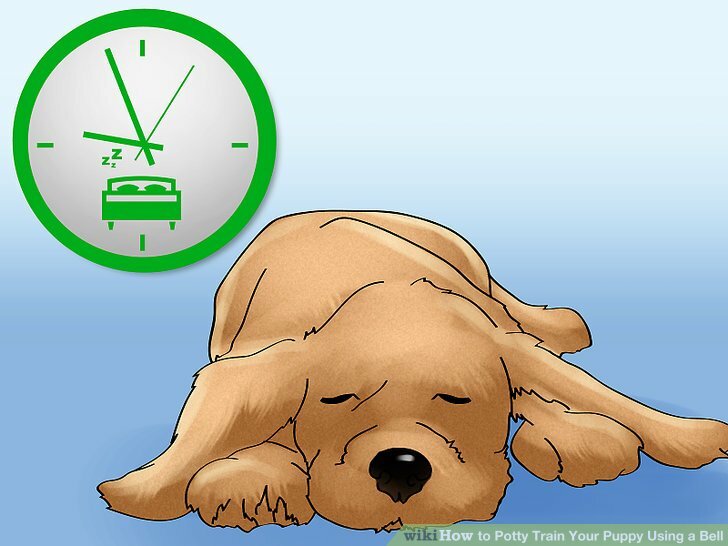 Do this 2-4 hours after putting your dog to bed. It’s best to let the dog out every two hours the first night or two, just in case. Begin increasing the time between wake-ups from every two hours to every four hours over several days or weeks. This will depend on the breed and how much your puppy sleeps. — Use your discretion. Daytime napping is important for puppies, but if you let him nap all day, he won’t sleep at night! 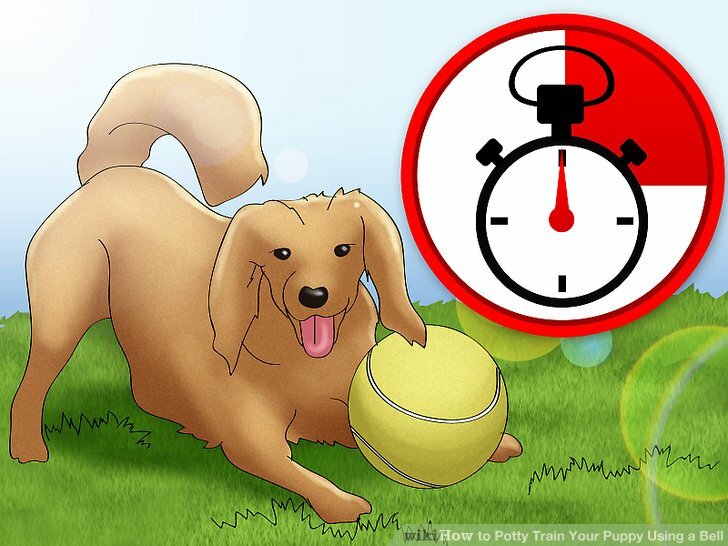 Create a play schedule for your puppy. Play-time is an important part of your puppy’s development. During play, he’ll learn that he’s not allowed to bite or scratch, while working off his meals and growing strong and healthy. It also wears him out so he won’t have excess energy that keeps him awake during scheduled nap or sleep times. A regular play schedule will keep him on his sleep schedule. Training sessions should be fun enough for the puppy to count as play-time! Keep your puppy safe while he plays. Help him avoid things like falling, getting stuck, or eating/chewing on things he shouldn’t. Buy a crate for your dog. 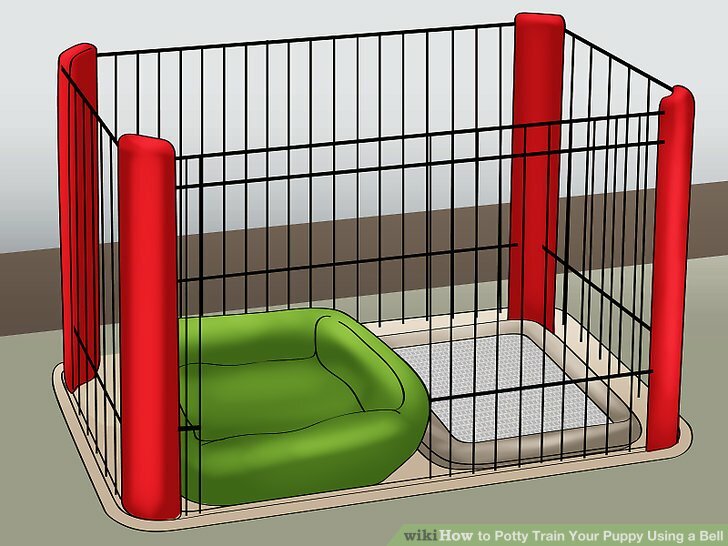 Crate training is the first step in potty training. Choose a crate with enough room for your dog to turn around comfortably. However, it shouldn’t have so much room that he could use the bathroom in one corner and sleep in another. If your puppy learns to associate his crate with using the bathroom, he’ll resist going into the crate to lay or sleep. In the first few weeks, expect accidents in the crate even if it’s the right size for the puppy. Don’t lose your patience, though! He’s still learning. If your puppy is a larger breed, consider buying a crate with adjustable barriers that can be removed as the dog grows. Get your puppy used to the crate. Place the crate in a busy room in the house, where people gather often. The den or family room is a good location for crate training. Leave the crate door open so the puppy can explore it at his own pace, and treat him whenever he goes into the crate. After he’s grown used to the crate, start closing the door and leaving him in it for longer periods of time. Crate him at night and anytime you aren’t home or able to watch him. You can move the crate between rooms, bringing it into the bedroom with you at night, for example. But always make sure it’s somewhere your dog feels safe. Assign a regular bathroom spot. Take him to that same spot every time you take him out. If he associates going to the bathroom with a very specific place, he’ll be less likely to have accidents in other places. It’ll also make clean-up easier in the future because you’ll know where he likes to go. Limit the puppy’s outdoor time. Minimize how much time he plays outside during the first 2-4 weeks of potty training. Playing with the dog outside in the middle of his potty training will confuse him about what he should do when he goes outside. When he’s mastered potty-training, you can start spending more playtime outside with him. Encourage your puppy to use the bathroom on command. Choose a specific word or phrase to serve command him to use the bathroom. “Bathroom” or “Go potty” are examples. When you take him outside, use that same phrase and the same tone of voice every time he goes to the bathroom. If your puppy uses the bathroom after you give the command, praise him with a lot of excitement and a treat. You might also choose a separate command specific to encouraging your dog to defecate. 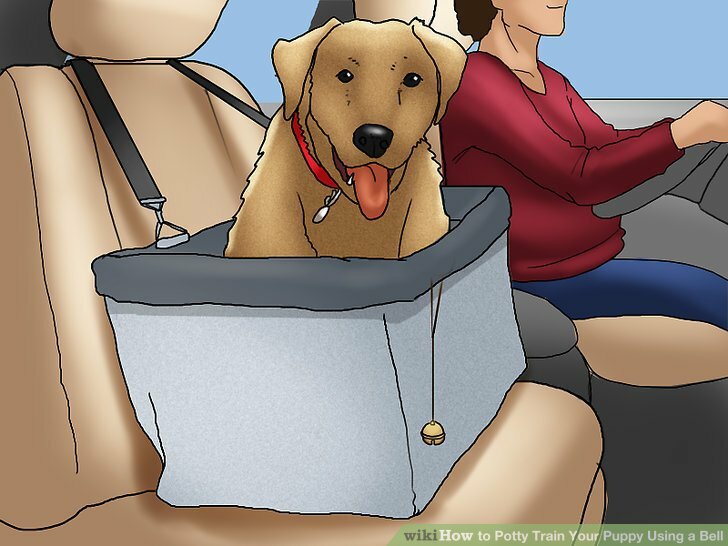 Young puppies need to defecate more often, so teaching a dog to associate a specific command with defecating can be useful. Crate the puppy if he doesn’t potty on command. This isn’t a punishment, but a training tool. If your puppy doesn’t use the bathroom within a few minutes of you giving the command, put him in his crate for 5-10 minutes. The dog may whine or cry when confined to the crate, but don’t let them out.–It will confuse the learning process. After 5-10 minutes have passed, take him back outside to use the bathroom and give the command again. Repeat the process until he makes an attempt to use the bathroom after you give the command. When he finally uses the bathroom, repeat the command and reward him with lots of praise and a treat, then let him back into the house to play. Incorporate the bell into potty training. Hang the bell by the door you use each time you take the dog out. It should hang low enough for your puppy to reach with his paw or nose. Use the bell only with a single door at first. You can move the bell or add more bells at other doors once the puppy understands how the bell system works. Very small breed dogs and very young puppies may not be able to hold it long enough to reach the door that leads outside. In that case, hang the bell wherever the dog spends the most time — the living room, for example. You can move the bell to the outside door when the puppy can hold it a little longer. It helps to keep the dog’s living area small during the stage until potty training is well established. You might use a puppy gate and attach a bell to it. Teach your puppy to associate the bell with positive things. 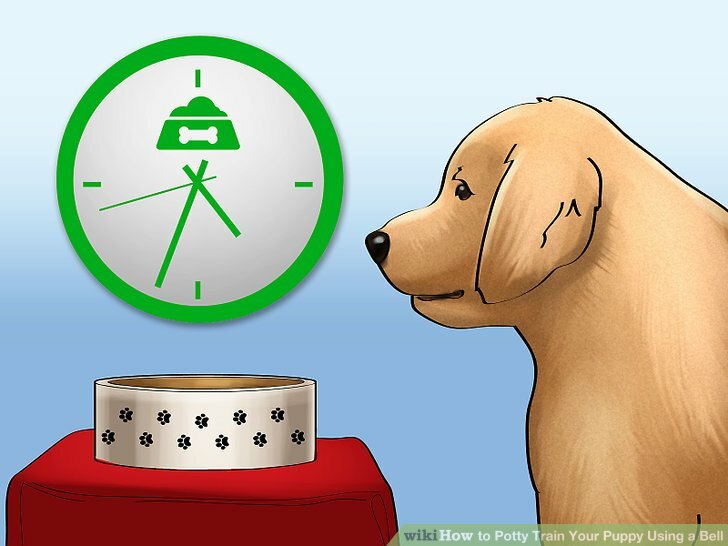 If your puppy seems scared by the bell sound, you need to make him comfortable with the sound before using the bell as part of potty training. Hold out treats near the bell, and ring it when the dog comes to retrieve the treats. You might smear a little cheese or some other treat on the bell, and, when the dog touches the bell, reward him with an additional treat. Repeat this process until the dog knows to associate the bell with reward. Teach the puppy to ring the bell himself. 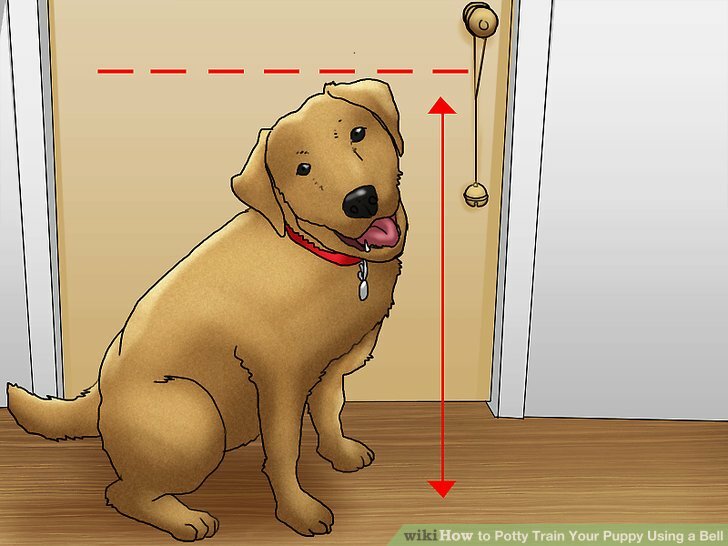 Without ringing the bell yourself, tap your fingers on the wall or door next to it, and say “Outside.” Your puppy should learn to jump up to your fingers, ringing the bell in the process. 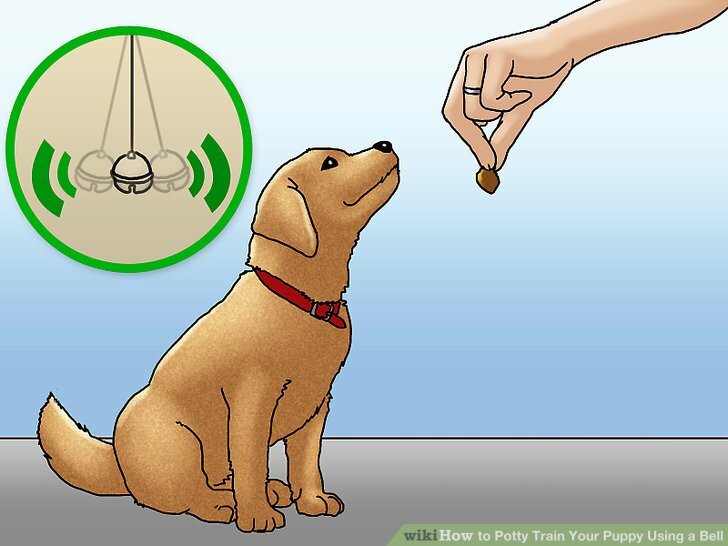 Hold a treat just behind the bell, and say “Outside.” The puppy’s nose will ring the bell when he goes for the treat. Skip the bell training if you’re rushing out for a bathroom emergency. Only use the bell with scheduled bathroom breaks. Your puppy is very smart, and has a great sense of cause and effect. Anything he observes before the door opening/praise/treat will be seen as a cause of the desired effect. If you let variation creep into what your dog experiences before the door opens, he can become confused. Make it easy for him to learn what he needs to do to be let out. Keep it simple. For example, only use one of the methods outlined in the previous step — don’t mix and match. Expand bell usage after the puppy has learned how to use it. You can either move the bell to different doors or hang a different bell by each exterior door. When you travel, take a bell with you so the dog can use it while on the road. Similarly, send the bell with your dog if he stays at another home while you’re away on a trip. If you need to find a new home for your dog, let the new owners know he’s bell trained, and encourage them to make a bell available at the new home.